I’ll start with the asbestos seam tape on the duct work and then the actual duct work next. This is asbestos seam tape. It’s usually a high percentage but not necessarily dangerous if in good shape and left alone. My parents house was built around the time after the St. Louis 1904 Worlds Fair. Stone foundation, concrete floor in basement. They bought it 1981 for $37,000. They are getting ready to sell it and it’s worth over $300,000. But it has old house problems. The asbestos is one, but I’ll take care of that next week. It’s my day job anyway, so a few hours on a holiday weekend won’t eat into my holiday plans. Here is the kitchen and the addition and view of the backyard. Everything above the basement was gutted and redone in phases, removing the old lath and plaster, installing new electrical work, and drywall. ( no pictures of that because my phone was dying) but the biggest problems are in the basement. You’ll notice the dual furnaces. One was put in along with the addition. There is a problem I just noticed today. The return for the main furnace was cut & capped. And the additional furnace put in its place, and attached to it. See crayon diagram below. The photos above that show the hacked up holed up, is where they added on the extra duct to get a return air in the back room. The rear furnace was barely used in the winter because no one lived in there mainly. My dad got as much asbestos off as he could and is having a hard time with the rest. 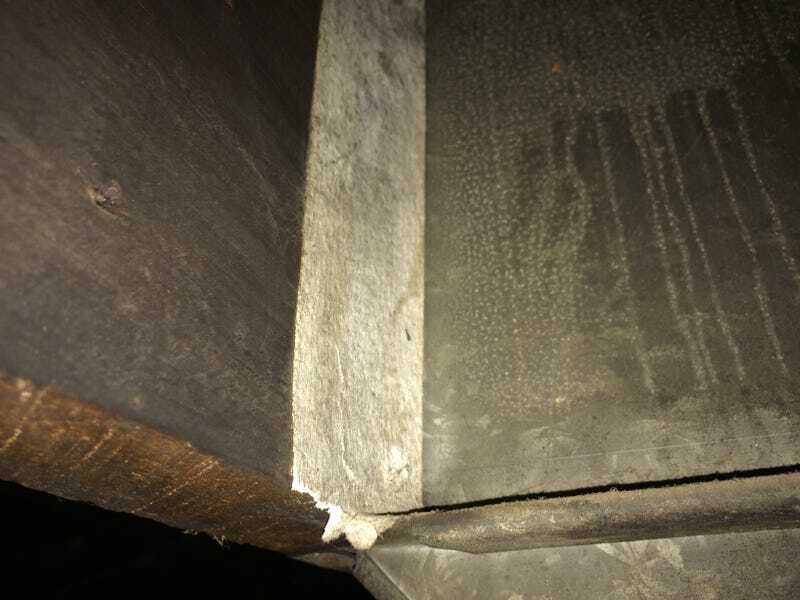 The triangle holes were covered with the asbestos patch also. The other holes above the triangle was water lines running through the ducts. My head was hurting after all this. Then go into the basement section of the addition and see what the paneling had been hiding all these years(my mom took 3 walls out in this area this week. ) CMU block walls that the dirt has pushed in over time. And a sunken floor. They had bought another house and been moving 30+ years of stuff there over the last few months. I’m not sure what they are going to do about these things, but I doubt any inspector would let these fly .